Northwoods understands that human services workers have a lot on their plates. The last thing they need to worry about is having to search through piles of documentation just to figure out how to use our products. That’s where online help comes in. The Northwoods Technical Communication team spent much of 2013 converting Northwoods’ extensive product documentation library—over a thousand pages—to a help system that is easy to use and paves the way for exciting things to come. 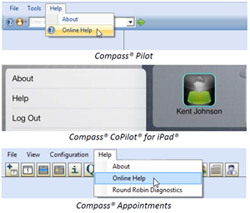 Beginning with version 6.1, users of Compass® Pilot, Compass® CoPilot® for iPad®, and Compass® Appointments can access the help system from directly within the application. The help system uses an intuitive navigation pane that acts as a table of contents. Not only does it list all topics in a particular guide; it also indicates the current topic (with orange highlighting) and provides an at-a-glance look at how the current topic relates to neighboring content in the documentation. When the reader clicks on a topic that contains subtopics, those subtopics appear below the main topic in the navigation pane. In most agencies, only a select number of people perform configuration or other administrative functions. It makes sense, then, that only those people would need to see configuration or supervisor guides. Similarly, a Front Desk worker may only need to see documentation pertaining to their specific duties. As such, access to our guides can be granted based on a user’s permission level in the product. Save time by searching across an entire set of product documentation at once. This is especially useful if the reader is unsure about where a particular topic is located. Entering a term in the search box will return results from each document the user has permission to view. Furthermore, when a user selects a topic from the search results, all instances of the search term can be highlighted in the resulting content. We understand that many people learn by doing. Luckily, not only is our online help system an intuitive platform for text instructions; it also provides a vehicle for multimedia content. We’ve integrated several interactive tutorials for Compass CoPilot for iPad into the help system. Stay tuned as we integrate how-to videos and tutorials for Compass Pilot and Compass Appointments in the coming months. Northwoods understands that human services workers have a lot on their plates. The last thing they need to worry about is having to search through piles of documentation just to figure out how to use our products. Northwoods converted its extensive product documentation library to a help system that is easy to use and paves the way for exciting things to come.